Just a reminder for those attending this weekend’s Pitchfork Festival in Chicago’s Union Park that Savages are playing on the Green Stage Saturday at 4:15pm, while Car Seat Headrest are making their (domestic) P4K fest debut on the Red Stage Friday afternoon at 3:30pm. In addition, Car Seat Headrest are at the Empty Bottle Saturday night at midnight and while advance tickets are sold out, a limited number of tickets will be available at the door. 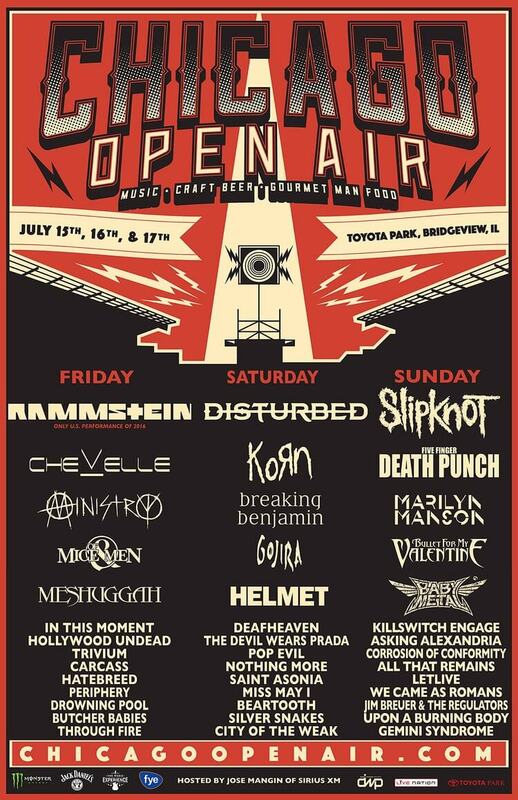 If the above events aren’t to your liking, Disturbed, Korn, Breaking Benjamin, Drowning Pool, Asking Alexandria and some version of Page Hamilton’s Helmet are taking part in a craft beer exposition in Bridgeview, IL this weekend. I’m told tickets are very much available (which is probably a familiar refrain whenever Drowning Pool are playing), so use that information as you see fit.